My first ride in Greyhound’s Scenicruiser was like going to heaven. Hemmings file photo. “Can you spare a buck?” the alcohol-challenged “gentleman” asked loudly. Where did he come from? Why didn’t security stop him? Well-dressed men and women stared. I knew they wondered what I would do. “Please, sir, I haven’t eaten in days,” the man implored. Why is this happening I asked myself, and why today in the Dallas Greyhound Bus Terminal? I had worked for months setting up the contract ceremony between my employer and the bus company. Two hundred guests watched executives on a stage give speeches and unveil a computer system designed to automate Greyhound’s ticketing and scheduling. Digging in a pocket, I pulled out a few dollars and handed them over. The “gentleman” thanked me and disappeared into the terminal’s bowels. Nearby guests and I gave a collective sigh of relief. The ceremony ended with applause, snacks, and high spirits. As I left the terminal, an enormous silver bus with a leaping Greyhound on its side lumbered past, diesel engine spewing black smoke. I had a flashback. The sight transported me from 1988 to 1957…and a hot summer day when I took my first Greyhound bus ride. The vision of that day was indelibly imprinted on my 13-year-old brain. 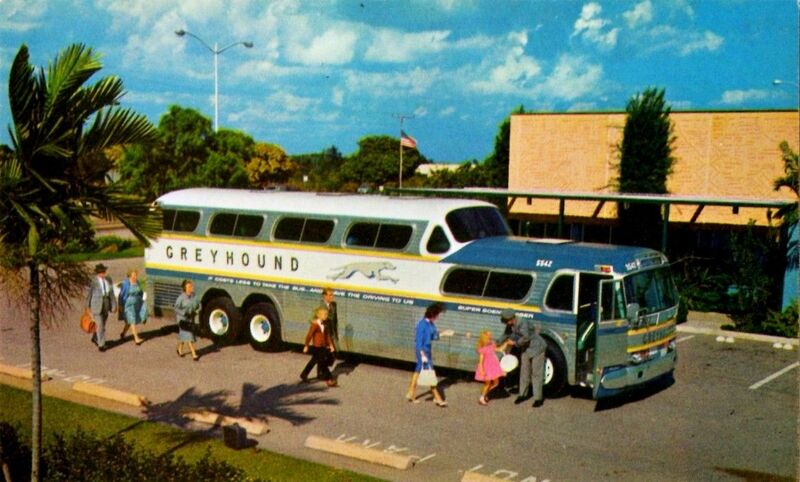 I was in heaven as I watched the pride and joy of Greyhound’s fleet pull to the curb. The enormous double-decker Scenicruiser, its sides paneled in aluminum, dazzled my eyes. Airbrakes hissed as valves opened. A powerful diesel engine purred quietly. I was in “heaven” as I watched Greyhound’s “Scenicruiser” pull to the curb. Hemmings file photo. “Am I taking this bus to camp?” I asked my parents. Sweating, they were tired and grateful the bus finally arrived. We had waited more than an hour at New York’s Port Authority Bus Terminal, a mammoth facility choking with diesel fumes and throngs of people. Vehicles on its cavernous ramps assaulted eardrums with loud engines and screeching brakes. Travelers screamed farewells over the din. A boy my age was my companion on the eight-hour journey from New York City north to Pittsford, Vermont. We were returning to a boy’s camp set in green forests above the waters of a spring-fed lake. Without saying goodbye to our parents, and before they could restrain us, we ran to the Scenicruiser’s door. The bus driver barely had time to move as we rushed up a flight of stairs. Throwing duffel bags on over-stuffed reclining seats, we now “owned” the best view on the bus. Our high perch faced an 8-foot-long, 3-foot-tall tinted window overlooking the first-level bus roof and highway. I think I waved goodbye, but probably didn’t. The bus pushed us back in our seats and jerked forward as gears meshed, diesel engine roared…and the view ahead looked scary. “Watch out!” my mind silently screamed. It appeared we might hit the terminal’s low roofline. 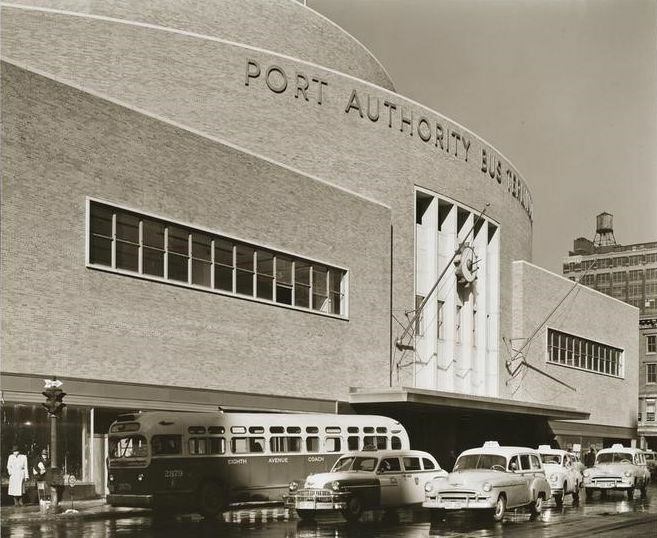 The New York Port Authority Bus Terminal was where I began my first Scenicruiser ride in 1957. Photo via Museum of the City of New York. Down circular ramps the bus flew, our view of turns distorted. Would we smash into the walls? An 18-wheeler approached when we reached the highway. I could see myself flying through the windshield and landing on the Mack truck’s bulldog hood ornament. Eight hours, including a 30-minute rest stop before leaving New York and entering Vermont, flew by too quickly. We put up our feet, legs spread, confident and cocky, and looked down on the world. Bugs hit the windshield a few feet from our faces, spreading guts everywhere. 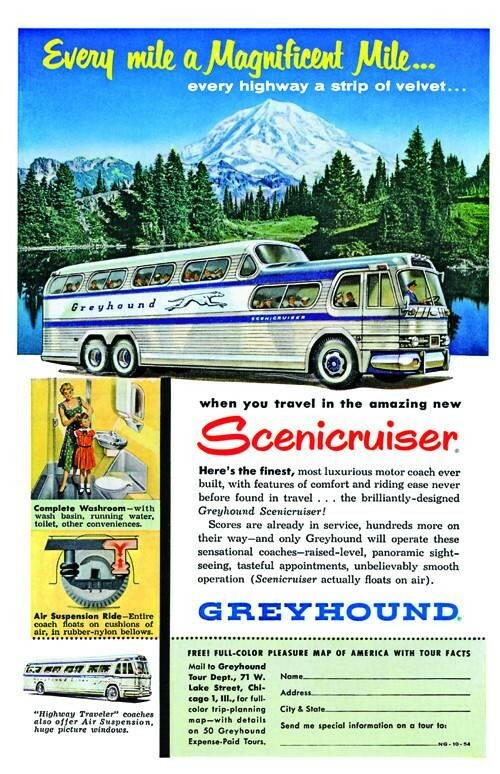 My first Scenicruiser memories began in 1955. The 40-foot bus, designed by Raymond Loewy, who conceived the 1953 Studebaker’s stylish lines, featured an industry-first restroom and showed up in Life magazine photos. They accompanied stories touting America’s developing interstate highways and the spectacular buses that would take you almost anywhere in luxury. 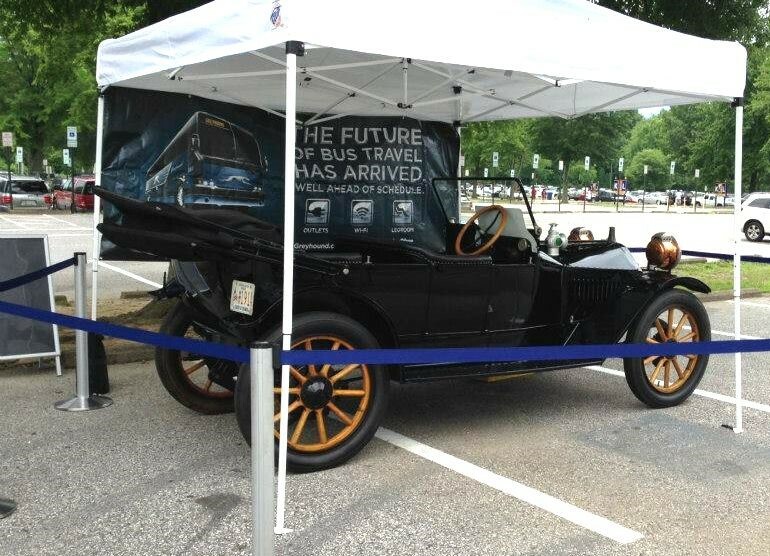 Martis Jerk’s 1914 Hupmobile helped the Swedish immigrant start a bus company. Photo courtesy Greyhound. America was on the move. And so was the Greyhound Bus Company, which, along with the nation, was experiencing rapid growth after World War II. The company’s tradition and history helped shape America. In the 1920s, it brought people from rural areas to the cities. Greyhound buses transported troops during both World Wars. And migrant workers rode its buses during the Great Depression. The company was founded by a Swedish immigrant, Martis Jerk, who changed his name to Eric Wickman after coming to America in 1905. Jerk, or Wickman, was an immediate failure when he invested life savings in a Hupmobile dealership in the mining town of Hibbing, Minnesota. He didn’t sell one car. Miners simply didn’t have the money. Undaunted, Wickman figured out what miners needed: transportation to and from a nearby town, Alice, where they swallowed their miseries after work. He used the only Hupmobile he owned, a 1914 model with seven seats, to transport them on the 4-mile round-trip at 25-cents a man. He’d stuff 15 miners into the vehicle each time. A few even hung on to bumpers. It didn’t take long for Wickman to attract a partner, a Swede named Andrew Anderson, and start a new company, Mesaba Transport. A series of mergers and acquisitions resulted in the men forming another company, Northland Transportation. It combined several Minnesota and Wisconsin companies and became the nation’s first interstate bus line. The Great Northern Railroad purchased Wickman’s company in 1925, but kept him on to run the operation. Now he had the cash to go national and he soon operated the first intercity buses. In a surprising move, the railroad company sold the operation to Wickman in 1929, the year he changed its name to “Greyhound.” The icon was born. It was the 1930s and Wickman adopted a new image for Greyhound. Although the nation was suffering from the Great Depression, he promoted buses as an exciting and comfortable way to travel the country. He bought a fleet of GM “Super Coaches,” supplied by the Yellow Truck & Coach Manufacturing Company, which featured rear-mounted engines and metal bodies. “Know how Columbus felt” was the company’s slogan when it became a sponsor of the 1933 and 1939 World’s Fairs. The new image and exposure catapulted Greyhound’s growth. 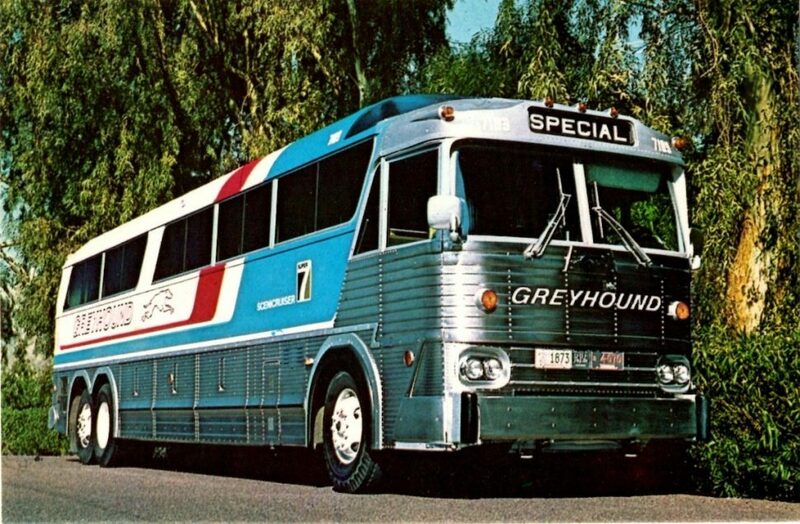 By World War-II, Greyhound’s new, unpainted, fluted aluminum-sided vehicles—called “Silversides”—became the first mass-produced buses to have air conditioning. The smell of raw gasoline was overwhelming. As I looked above and watched the gasoline level drop in a 10-gallon glass container, a bell rang each time another gallon fed into the tank of my family’s 1937 Nash. The ancient mechanical pump worked slowly, as did the service station mechanic who turned a crank to fill the container. I remember Greyhound’s “Silversides” buses from the late 1940s. Hemmings file photo. Darkness was filled with crickets’ songs as my parents and I, along with an older brother, waited for the Greyhound bus to arrive. It was farm country on a lonely road in 1949. My brother had just completed a job on a dairy farm in Ottawa, Canada, and decided to take the bus home. We heard the bus before it was visible, then it came to a noisy, smelly stop near the pumps. Most passengers were asleep. I waved goodbye and watched the shiny, streamlined vehicle slowly disappear again into darkness. 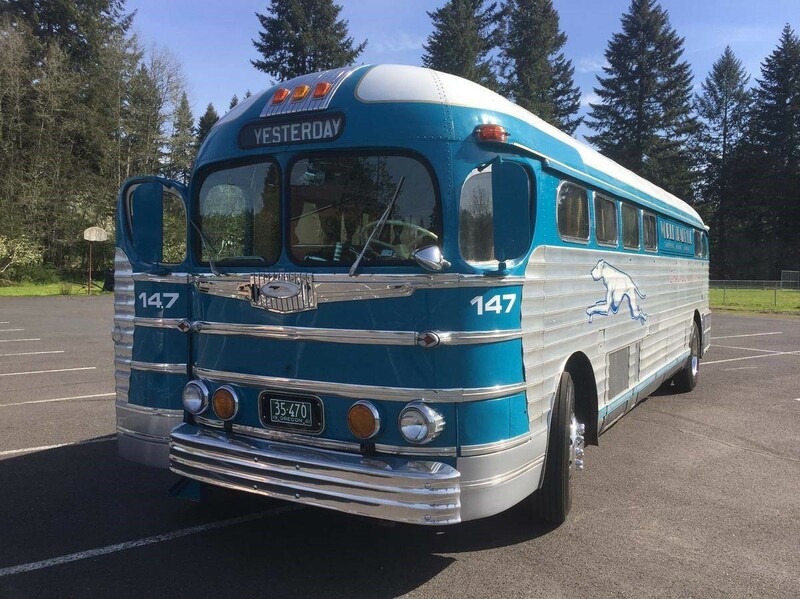 Today, as I study photos of Greyhound buses manufactured after World War II, it’s clear the first one I saw was a “Silversides” model. It made a deep impression on a five-year-old boy. I wanted—desperately—to ride on that bus. But I had some growing up to do first. From my earliest days, while playing near a busy street, buses roared past every hour. I’d hear them coming, diesel engines struggling. They ran from 6 a.m. to 8 p.m. every work day, with shorter weekend hours, carrying residents to our town’s center and nearby destinations. These were the buses that replaced the trolley service, an electric line built around the start of the 20th century. The trollies disappeared right after World War II, their steel wheels silenced when tracks were paved over. It cost a nickel to take the bus into town. A metal box mounted on a pole next to the driver rang when you inserted a coin. Buses intrigued me. I knew they were different than trucks because their engines were rear-mounted. They made unique sounds, too. Engines wheezed rather than roared, and transmissions shifted with loud thuds. Years of smelling their diesel fumes conditioned my nose. Then, in 1953, a new Greyhound bus showed up. I didn’t know then it was called the “Highway Traveler.” But I sure knew it was gorgeous. I thought Greyhound’s 1950s “Highway Traveler” buses were gorgeous. Hemmings file photo. “Highway Travelers” took me down many roads as a teen. They afforded inexpensive travel during the years before I acquired a driver’s license. Greyhound rides usually started at Newark’s Pennsylvania Railroad Station. Greyhound buses, lined up in perfect order, departed in front of the station. My frequent weekend destination was Allentown, Pennsylvania, home of boyhood friends. I knew immediately where I wanted to sit after boarding: the long row of seats in the back. Not many passengers sat there and I could spread my legs. Sometimes it was smelly. The tiny rest room was poorly ventilated. I noticed one day my shoes picked up brown, sticky fluids, cigarette butts, and used toilet paper. Fresh air coming from the front often turned putrid when it reached rear vents. There was no way to open windows. But I didn’t care. This was my “hideaway,” a place to observe the world anonymously. Then one day it all changed. I first saw the guy from the sidewalk-side window. He was tall, around 30, and his rolled-up sleeves revealed tattoos. I wondered if facial scars were from a fight. “Mind if I sit here, kid?” he asked. I hoped he wouldn’t walk to the rear and sit near me. After asking where I was headed, he decided I was a good audience and told me he was an ex-con. I stared in disbelief…and fear. “Wanna see my gun, kid?” he asked. Before I could answer, he reached into a pocket and retrieved a chrome-plated pistol. “Why do you have that?” I asked, naively. He cocked the hammer, held the weapon in front of my chest, and pointed the barrel at the window. My mind was in flight mode. But the bus ride was almost over and the gun quickly disappeared. He did, too, when the bus stopped. A young boy aged years in a few minutes. Worn out Greyhound buses, a million miles on odometers, were never junked. The company sold them to rural bus operations. Then they were rebuilt and put back into service. I rode on several reconditioned “Highway Travelers,” especially during my first year of college. The college choir, along with boxes containing robes, equipment, and wooden risers, were stuffed into two buses that huffed and puffed over Pennsylvania’s Allegheny Mountains every weekend. The grueling routine kept up through the spring. It was practice for a European summer concert tour. In June, the old Greyhounds took us to New York’s Idlewild Airport and an 8-hour flight over the Atlantic Ocean to Great Britain. 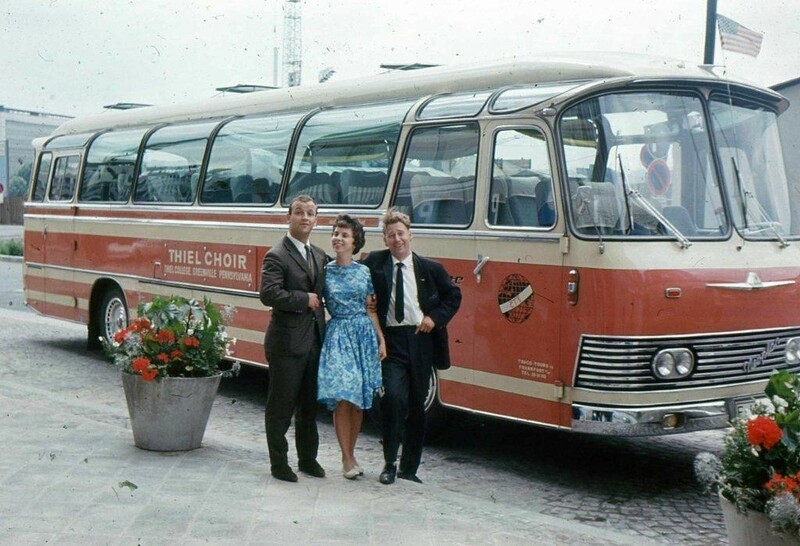 Our bus drivers safely navigated Europe’s highways during a college choir’s tour in 1963. Photo by Joel Haas. Once again, buses were the focal point of my life. Although smaller than their Greyhound counterparts, European buses were comfortable and safe. Expert drivers transported us to cities in England, Holland, Germany, Austria, Luxembourg, Switzerland, Denmark, Sweden, and Finland. East Berlin police scrutinized the buses when we passed through “Checkpoint Charlie.” The “Wall” was only a year old and East Berliners were desperate to escape lives under Communism. As guards checked passports and examined robe boxes, we were reminded that many East Germans were shot when discovered hiding in trucks and buses. That was a long time ago, and buses, whether Greyhounds or other brands, played a lesser role in my life from that point forward. After my wife, Grace, and I bought a house and had children, cars took over. Every so often, however, we’d take buses into New York City. But since we moved to Texas, I haven’t been on a Greyhound bus in decades. Offer me a ride in a Scenicruiser, however, and I’d jump aboard, sit in front on the top deck, and never get off.